Did I forget the mention the Golden Howdah? 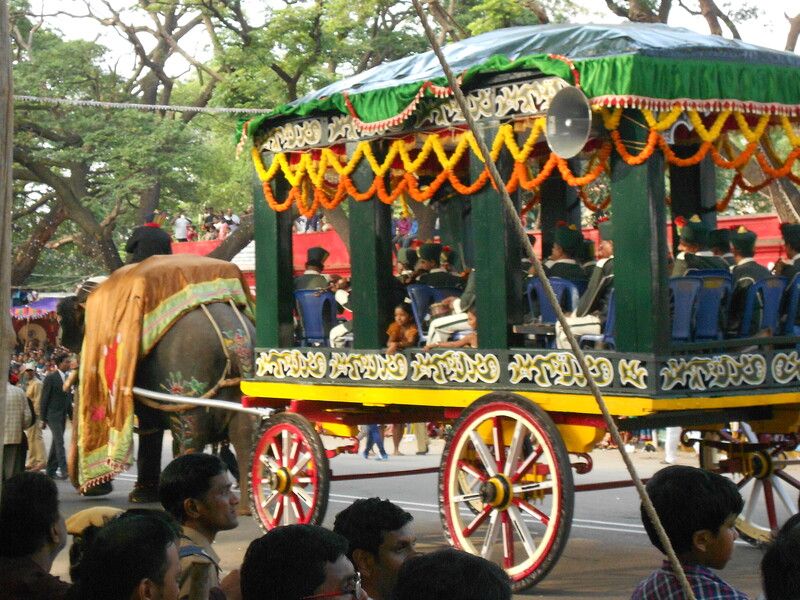 The highlight of the Jamboo Savari are the elephants at the end, including the large central elephant carrying the Golden Howdah. This year the caparisoned elephant was Arjuna, carrying the 75 kg (or almost 200lb) solid gold Howdah bearing the idol of Goddess Chamundeshwari. Originally it was used to carry the Maharaja of Mysore. Notice the armed guards surrounding it? Don’t ask me how anyone could manage to steal it in this setting. Maybe by helicopter? This elephant was injured while pulling the band cart.